Meeting Dame Stella Rimmington, a former director general of MI5, was a refreshing one albeit an impromptu five-minute one. Despite having left the organisation two decades ago, she is still considered as one of the best experts on the secret services, an avid commentator on privacy and intelligence. She was not only the first female DG of the MI5 but also the inspiration of Dame Judi Dench's M in James Bond. Security is an excellent field for females "who are now working in all areas of the intelligence service" she added, on the technological, analytical and the more straightforward intelligence gathering side. "Women are just as good as men", she said with a cheeky laugh. On the topic of privacy and data security, Dame Rimmington believes that the subject is not "black and white". There has always been a potential conflict between our privacy and the government's need to protect its citizens. Where the balance lies, she said, depends on how serious the threats to the nation's safety are. The important thing being to have adequate legislation to cover the work of the intelligence and the police to gather information necessary to protect us. People have always been at the heart of data gathering and despite the immense steps forward in terms of technology, she still believes that humans, as flawed and unreliable as they may be, still have an important role to play. "The whole world is communicating via technological means. Interception of communications, is getting more complicated and varied and our intelligence services need to keep up. I believe that there is still a need for the human element because although technology can reveal certain things, human beings can reveal different things". "Nuances, perhaps as well as immediate information that you might not be able to get from technology". Technology and humans work hand in hand (not literally). It is increasingly difficult to get human agents in certain situations because of the international nature of some of the threats. The development of human resources for these tasks, she added, is not as easy as it was decades ago. Our conversation then segued to Facebook, the biggest social networking website that knows almost all about its 1.6 billion members, something that even the FBI of Edgar Hoover and the East German Stasi were only able to dream of. They would have been "very confused" by the sheer amount of data being collected smirked Dame Rimmington. "It is very difficult to imagine the people of the 1960's being faced with today's technological world because they wouldn't have understood it". They wouldn't have had the means of analysing it. That's the point really. Faced with "a plethora of information", any intelligence service still needs to make sense of it, by algorithm or otherwise, or else one runs the risk of being overwhelmed. 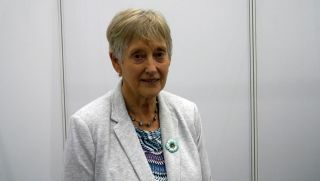 I met with Dame Stella Rimmington at IP EXPO Manchester, where she was the keynote speaker.